Ste p1 : Download the Tiles jar file from here. Step 2 : Add following jar files in the lib folder of the web application. banner.jsp, common_menu.jsp, credits.jsp, cssPath.jsp, home_body.jsp and SideBar.jsp. Step 4: Create a master layout page. Read more on configuring tiles attributes. Below output shows the layout. Step 5: Now create a “tiles-defs.xml” in WEB-INF Folder, which have all the configuration. The attribute “name” defined in tag “tiles:insertAttribute” comes from above configuration file and replaced by the pages specified. 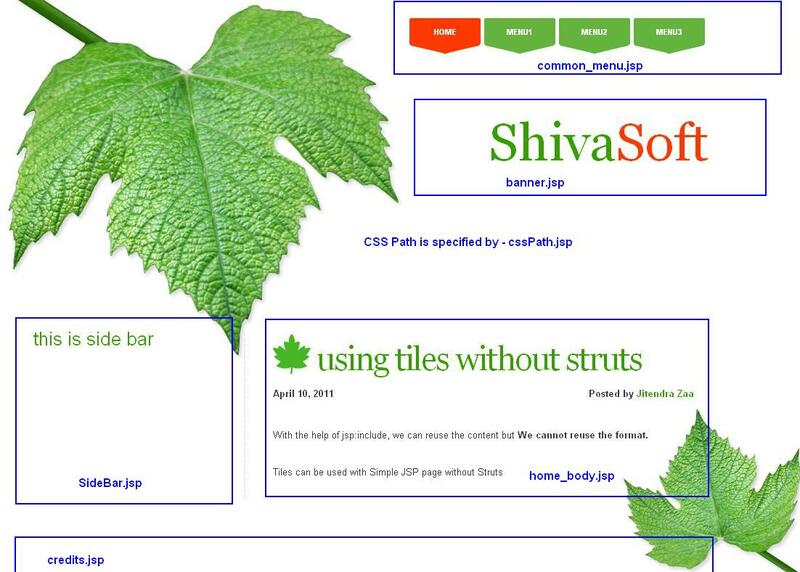 Step 6 : Now create the jsp page which uses the Tiles template defined above. Template name “myapp.homepage” is looked up into file “tiles-defs.xml” and configuration is applied at runtime as per definition. Download the war file from here, change extension from “zip” to “war”. Please help me change extension from â€œzipâ€ to â€œwarâ€. Select the file . press F2 and and rename. I did all the configuration as mentioned above but I’m facing below exception. I use TilesListener to load the definitions. Please check that whether you are using any servlet or nay mapping of tiles with name “test.dummy”. Search your application for this text. The issue was because I used TilesListener which is deprecated. Issue got resolved when I used SimpleTilesListener. This listener automatically looks for tiles.xml under WEB-INF. No need to specify tiles xml location in web.xml. Thanks for your time in replying to my post. Kindly help in tracing the error. Hi,thanks for such a quick response. Hi what is the use of BasicTilesContainerFactory. What is the function of the class file that is in you WEB-INF/classes folder. I got my previous answer. I want to know how to define about the config in web.xml? Is it required? Is there any default config file name for which we don’t have to tell tiles about its config files location? Can you elaborate your tutorial more. Can u confirm if all jar files are in place as explained above ? hi .I have used all the Jars stated above..still not working..same error message is displayed..do i need to configure tiles.xml in web.ml..An class listner is required…. Do I need to specify the tiles config file in web.xml ? If not then how does application identify the tiles-defs.xml file?